2016 seems to be shaping up to be the year of the rematch. Yesterday, I wrote about Assemblyman Don Wagner challenging Senator John Moorlach in the 2016 Primary Election for the 37th State Senate District after Moorlach prevailed over Wagner in the 2015 Special Election for that same seat. 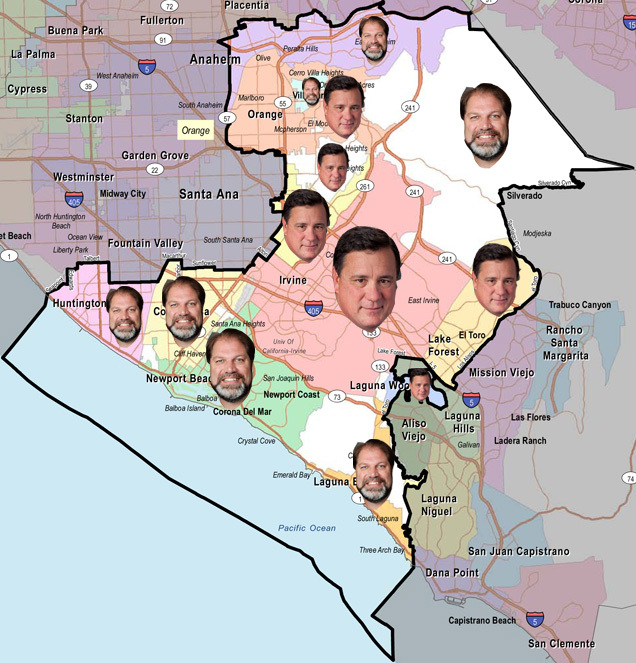 On the same day that Wagner submitted his application for an OC GOP endorsement for the 37th Senate District (nearly a month after Moorlach submitted his application), Councilman Greg Raths (R-Mission Viejo) pulled papers to challenge Congresswoman Mimi Walters (R-Irvine) in the 2016 Primary Election for the 45th Congressional District after Walters prevailed over Raths in the 2014 Primary Election for that same seat. In the 2014 election, the four candidates were California State Senator Mimi Walters (R), Educator/Businessman Drew E. Leavens (D), Retired Marine Colonel Greg Raths (R), and Buena Park Library District Trustee Al Salehi (NPP). In the 2014 election, Walters spent nearly $1,200,000 while Raths spent $267,000. Leavens spent $2,150, yet Salehi didn’t even open a committee. As of September 30, Walters had more than $616,000 cash-on-hand in her Congressional campaign account. Raths has no cash on hand, as he had terminated his Congressional committee in May and has not started a new one. After losing the 2014 Primary Election for the 45th Congressional District, Raths successfully won a seat on the Mission Viejo City Council in the 2014 General Election. Consequently, while the 2014 Primary Election for the 45th Congressional District featured State Senator Walters vs. Retired Colonel Raths, the 2016 Primary Election has Congresswoman Walters vs. Councilman Raths. In the 2012 Primary, then-Congressman John Campbell (R) still captured 51% of the vote against Irvine Mayor Sukhee Kang (D), who got 33%, and Small Business Owner John Webb (R), who got 16%. Campbell opted not to seek re-election in 2014, thereby creating the opening for Walters to run. 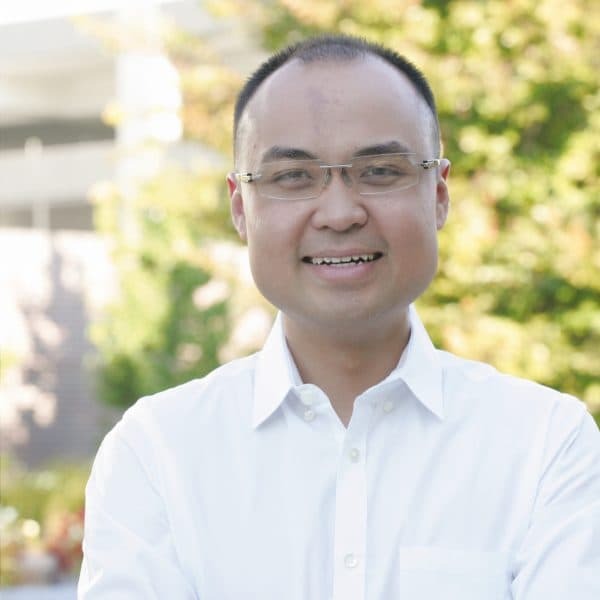 Kang termed out as Mayor of Irvine in 2012 and is now running against Assemblywoman Ling-Ling Chang (R-Diamond Bar) for the 29th Senate District, which does not include any portion of the City of Irvine. Rumors had swirled for months that Assemblyman Don Wagner (R-Irvine) would challenge Senator John Moorlach (R-Costa Mesa) for the 37th Senate District this year. Former Supervisor Moorlach had defeated Assemblyman Wagner for the seat just ten months ago by a margin of 50.3%-44.0% in the March 2015 special election to complete the unexpired term of State Senator Mimi Walters, who had been elected to the United States House of Representatives. Wagner has taken a very public step toward challenging Moorlach to a rematch in 2016. On December 7, Moorlach had submitted his application to the Republican Party of Orange County for an endorsement for re-election for the 37th Senate District. 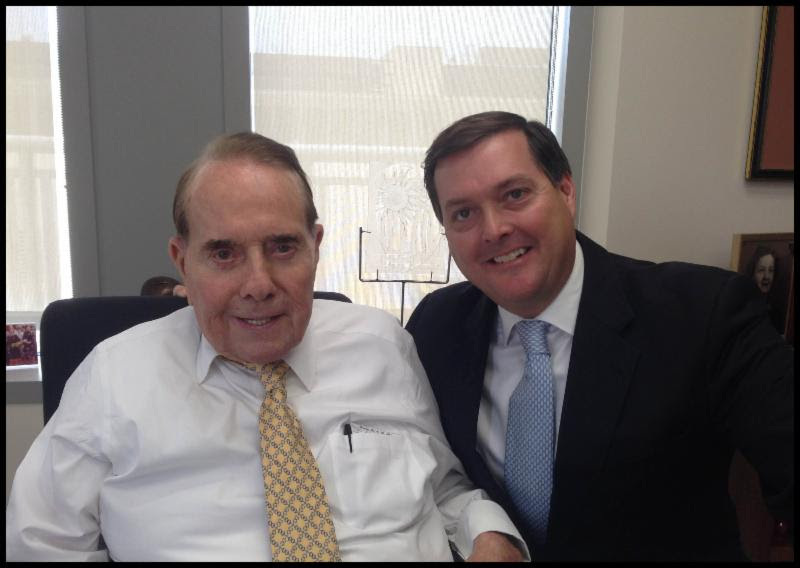 Then, yesterday, January 4, Wagner submitted his application for an OC GOP endorsement for the 37th Senate District. Otherwise, it should be a quiet January 18 Central Committee meeting, with Congresswoman Mimi Walters, Congressman Dana Rohrabacher, Congressman Darrell Issa, Assemblyman Bill Brough, and Assemblyman Matthew Harper all filed applications for endorsement of their respective re-elections in time for the January 4 application deadline for OC GOP endorsements for partisan seats in the Primary Election. Assemblywoman Ling-Ling Chang‘s bid for the 29th Senate District and Assemblywoman Young Kim‘s bid for re-election were already endorsed in December. 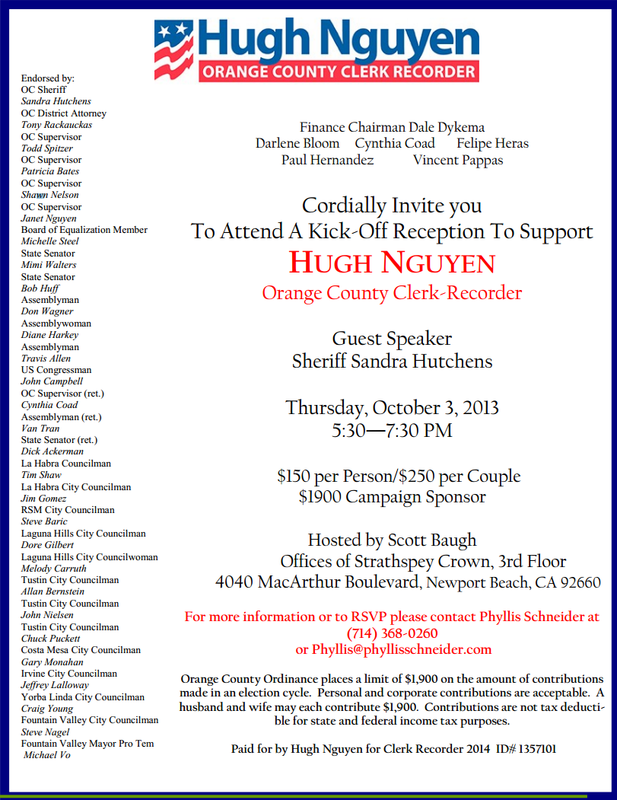 The OC GOP endorsement application deadline for nonpartisan seats in the Primary Election (County Supervisors and County Board of Education Trustees) is January 11, though Supervisor Andrew Do‘s bid for re-election was already endorsed in December. An incumbent holding partisan office has not been denied the OC GOP endorsement since John Campbell fell one vote short of the 2/3 needed for an endorsement when John Webb challenged him (two of OC Political’s earliest posts). 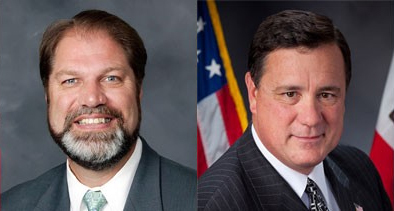 In the March 2015 special election for the 37th Senate District, Wagner spent $493,000 while Moorlach spent $276,000. Despite this significant funding differential of nearly 2:1, Moorlach still won the Senate seat. As of the June 30 campaign finance reports, Moorlach had $31,299.92 in cash-on-hand across two committees (Moorlach for Senate 2015 and Moorlach for Senate 2016) while Wagner had $84,416.71 cash-on-hand across three committees (Wagner for Senate 2016, Wagner for Assembly 2014, Wagner for Attorney General 2018). Presumably, Democrat Louise Stewardson, who ran as a write-in candidate in March 2015 will file for the ballot in June 2016. No word on if the hilarious Naz Namazi, “Naz, N-A-Z, Naz…a legal immigrant,” will be running again to challenge “a liar and a hypocrite” for this seat. There are four announced Republican candidates in AD-73: Rancho Santa Margarita Councilman Jesse Petrilla, Dana Point Councilman Bill Brough, Capistrano Unified School District Trustee Anna Bryson, and former Laguna Niguel Councilman Paul Glaab. One Democrat, Attorney and Irvine Valley College Professor Wendy Gabriella, has announced for the race. Gabriella’s entry in the race virtually guarantees a Republican vs. Democrat general election, with the Republican winning handily and spares South County Republicans an AD-73 general election intraparty bloodbath. Jesse Petrilla held on to his fundraising lead, but more notably, his massive lead from the previous fundraising period combined with his tight-fisted approach to spending has given him more cash-on-hand than all of his opponents combined. He raised $69,230 the prior period and $35,609 this latest period, giving him a total raised of $104,839. He spent a remarkably low $8,182 in both periods combined. Once loans and unpaid bills are accounted for, Petrilla’s $96,593 cash on hand exceeds that of all of his opponents combined. Anna Bryson spent slightly more than she took in during the latest reporting period in the second half of 2013, so she’s eaten into the money she raised in the prior reporting period from the first half of 2013. Fees dominated her spending. She paid a consulting firm, two fundraising firms, and a treasurer. Bryson raised $85,143, with $53,052 the prior period and $32,091 in the latest period while spending $32,140 in this period (and $10,570 the prior period), leaving her with $37,433 cash on hand once loans and unpaid bills are accounted for. Glaab secured the vast majority of slate mailers. There are five major slate vendors, with Glaab grabbing three of them, including the two vendors who produce the most slate mailers. Bryson grabbed one vendor. It appears the fifth vendor is up for grabs still. However, this massive spending has left Glaab as the only candidate in debt. Glaab raised $13,337 this period and $14,749 the prior period, for a total of $28,086. Adding his own $22,000, that brings that figure to $50,086, which is still the lowest amount raised of any of the four candidates. He spent a negligible $470 the prior period and $49,549 in this latest period. His aggregate $50,019 was the most spent of any of the four candidates. With the least raised and most spent, Glaab has heavily relied on his self-funding. Once unpaid bills and loans are accounted for, Glaab is $6,617 in debt.